Pain – Return to Health, P.S. Pain Research – Someone’s Got To Do It. It’s abundantly clear to me after this weekend, that the folks at the Neuro Orthopoedic Institute (NOI) group in Australia have been busy doing exactly that. My writing relies heavily on the hard research work of people like these and I am so happy not to have to be the one to produce it. I have the utmost regard for the kind of mind it takes to do that sort of work. I, on the other hand, much prefer bringing the information to real people for whom it has practical application in a way that makes sense to them individually. This past weekend, I was able to attend part of the NOI group‘s EP3 West Coast version of the US edition on Friday at the Washington State Convention Center. Those in attendance were primarily physical therapists, some with doctoral PT training, a few medical doctors, a few adjunct providers – one other chiropractor, a couple of osteopaths, nurses and a some psychologists. Axons and Dendrites and TLR-4 Cells Oh My! What I love about this particular body of pain research presented by the NOI group, is the neuro-biology of it. While sitting in the conference and happily soaking up the neurological terminology familiar to me, I wondered how well the basic physical therapy education covers neurology in the US. Chiropractors get extensive exposure to neurology with increasing detail through the progression of the 5000+ hours of doctoral level curriculum. It appears that Australian physiotherapy schooling also includes a fair amount of neuro-physiology training. As I looked about the room at the blank stares, I wondered if perhaps the American PT curriculum isn’t quite as rigorous in this area until perhaps the elective doctoral level? Something for the NOI instructors to perhaps become aware of. The minds behind this approach to understanding pain via this group out of Australia, is headed up by the two Australian educators who created the book behind the tour. One is a clinical and research physiotherapist and professor of clinical neurosciences at the University of South Australia . The other calls himself a “freelance educator” and sports the suffix EdD, also a physiotherapist who holds a graduate degree in “advanced manipulative therapy” which I believe is the Australian preference over chiropractic although it seems there is significant overlap. As with many different regions in the world there are political reasons that one profession is regarded more highly or accepted more widely. This weekend they were joined by a local talent, editor-in-chief of the Journal of Pain and University of Washington professor in the Department of Rehabilitation Medicine. Guess What? “Sh*t” Happens and That Same “Sh*t” Matters When it Comes to Pain. What tickles me about the NOI group research – at least as presented by the neuro-literate educator of the group – is that it is finally providing scientific evidence of things that we all as humans at some level already know. Life experiences affect our relationships with pain. Happy or sad, the things that happen to us as we navigate life, impact us in ways that can cement in time, our cellular reality. Our neuro-physiological responses to pain are significantly dependent upon the molecular patterns set up by a wide array of events and can set us up to experience recurrences of pain more easily or keep us from being able to find our way out of pain. I was pleased to see that the substance of their work corroborates what many of us who work extensively with patients in pain have always known, and that is the practical reality that pain is often independent of tissue damage. 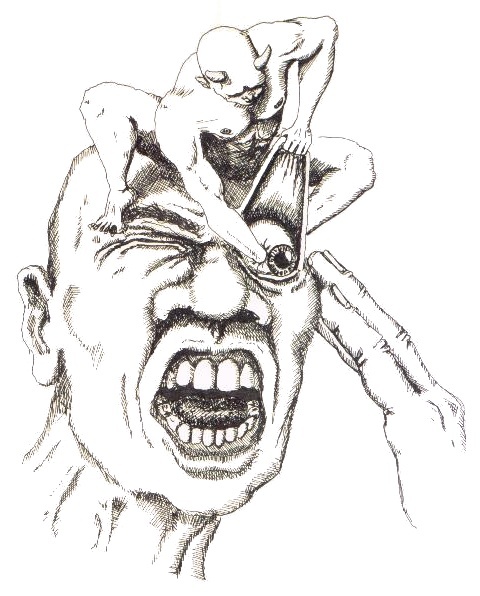 Long after a legitimate tissue disrupting trigger has passed, pain can linger. Pain can also return in the absence of proportional local tissue damage and this is where things get quite fascinating. The entire premise of my book series about everyday pain is that helping patients grasp the reasons behind their pain and helping them see that they are not irreparably damaged, massively speeds recovery from pain and keeps relapses to a minimum. The most lovely thing about these three clinical research masterminds is that they have uncovered and provided the science and research behind the validation needed to implement this pain education. The NOI group seems to be working to educate more clinical educators which is truly going to the source to effect change and I applaud that. It’s extremely important to refine the professional messaging behind how we greet pain in the practice setting and it will go a long way to changing our pain culture. But what I want to do and am focusing on with my publishing project these next few years but also farther into the future, is to bring much more of this directly to the patients – the everyday person. Pay to Play – Healthcare as Usual? I learned that it was primarily a few local larger medical institutions that brought this conference to their employees by virtue of allotted benefit dollars that provide them with reimbursement for continuing education. The cost of the conference was unfortunately prohibitive to anyone not affiliated with an organization with deep pockets. The financially prohibitive nature of these conferences (geared specifically to the mainstream medical institutions) presents a discriminatory challenge to equally qualified and information-hungry solo (or small practice) practitioners from a wide variety of relevant specialties. Nevertheless I must applaud the forward-thinking by these health care organizations and hospital groups for embracing the reality and changing attitudes towards the psycho-biology of pain. It is a changing world and there is hope. When I ask patients about pain, I’m always intrigued by the amazing variability in terminology or often the complete lack thereof. Maybe it’s because of growing up in a multilingual environment that I have a personal fascination with words and language in general. What’s particularly interesting to me is how inadequate words can be for all of us when trying to fully convey pain and sensation. Not only is there an endless variety of quality and severity, people who make a habit of “toughing it out” in the face of pain, actually lose their language for pain. Depending on modeled pain behavior in your childhood home, it’s also possible that this language was never even allowed to develop . 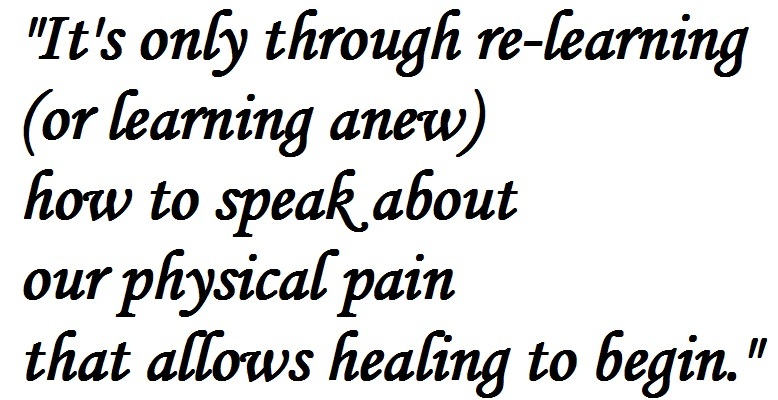 Based on what I see, I believe firmly that it’s only through the re-learning (or learning anew) of how to speak about our physical pain that allows healing to begin. First of all, on a simply practical level, if you cannot describe your pain with any convincing accuracy, someone like myself who is interested in learning about your pain in order to help you troubleshoot it and get rid of it, is working with hands tied. It’s not until I spend time with someone who has no language for their pain that I am reminded of how important it is to the successful outcome of any bodywork treatment. 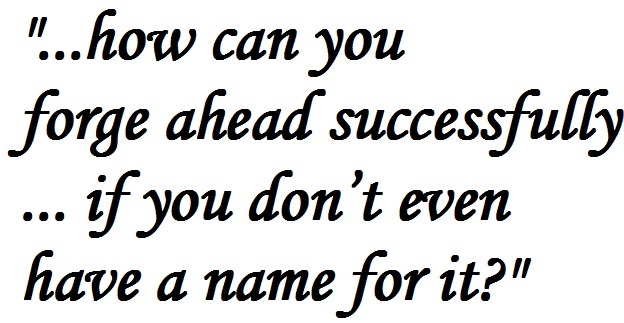 Secondly for yourself, how can you forge ahead successfully towards a cause – in this case eliminating your pain, if you don’t even have a name for it? For many people pain conjures up fear. The first rule of thumb about conquering fear is to name it and face it. If you say to yourself you’re unhappy, don’t you need to know what it is that you’re unhappy about before you have any hope of being happy again? Same thing with pain. Get specific. Dig deeper. I notice that the people who are the most conflicted about using the word “pain” tend to be the chronic pain sufferers – the people with high pain tolerance. (A topic for a separate blog post: people with a high tolerance for pain often are the ones who end up in chronic pain because of their inability to register the early warning signs – and yet they seem to be the ones who worry the most about being pain-“wimps”). These are the people who hesitate and insist instead on using a different, less loaded word because “pain” sounds too serious compared to their perceived discomfort. It’s okay if you don’t want to refer to your discomfort as “pain”, but you should know that by repeatedly dismissing the idea of pain you lose the ability to describe any aspect of it. For example, “pins and needles” is an important sensation that leads to very different approach in treatment than “stabbing” sensation. An “ache” can be very different than “stiffness” and both are significant to me but will change how I treat it. Sometimes the sequence and timing of sensation is meaningful and sometimes it’s the combination of sensations that points to the cause. Everything and anything that you notice is significant – even if you don’t want to give it any weight. 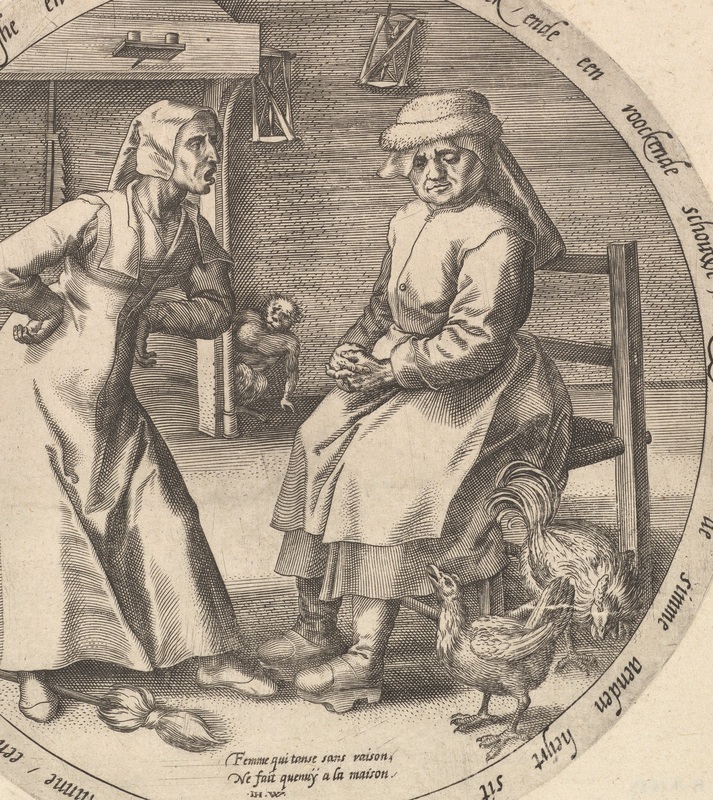 I believe this widespread issue of inadequate command of and connection with our language for pain, is what causes some physicians to quickly dismiss complaints as fabricated or baseless. If you are someone who is unable to describe your pain as anything other than “it hurts”, your concern will most likely be dismissed and you’ll be urged to medicate it away because no one has the words to understand it. If you’re like any reasonable person, after years – or even just weeks – of pain, certainly you would like nothing more than to distance yourself from it. Why would you choose to dive deeper into your awareness of it? Well this is exactly what I’m asking a lot of my patients to do and yes it can be a frustrating process. But it is an important step to solving the puzzle and taking control of what is within your reach. Start with basics like: “sharp”, “dull”, “burning”, “throbbing”, “grabbing”, or “stabbing”. If you’re still having trouble coming up with words that seem right, try thinking of how you can compare your pain or discomfort to other sensations you’ve had in your life like: a tooth ache, a stomach pain, stubbing your toe, catching your finger in a door or a drawer and other things like that. Those are all good starts and you will probably find that once you start the conversation the words will come to you more and more easily. I would venture to guess that at least half of the failed outcomes in physical medicine with any given practitioner has to do with how accurately the practitioner was able to interpret the patient’s pain language. I certainly have failed my share of patients in the past when there’s pain that I don’t know about or fully appreciate, which is why I’ve learned to ask so many questions about the “pain”. I will probably never seem alarmed by a sensation you’re describing but that is because most pain and discomfort makes sense to me. What doesn’t make sense and worries me more is when something I know should be hurting, is instead shrugged off or does not even seem to register. Start talking about your pain. 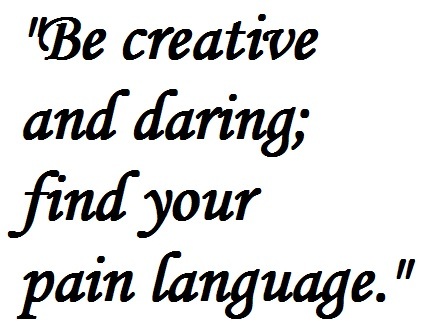 Be creative and daring; find your pain-language. It’s personal, unique and valid. There’s a good reason for your pain and it’s not out of your reach to figure it out and with some help to put an end to it. Above all, be patient with yourself. Pain is your ally not your enemy. It’s an important message to you about something that needs your help and attention. Practitioners: How does pain language affect your practice? Patients: Have you encountered this language barrier with your practitioners?